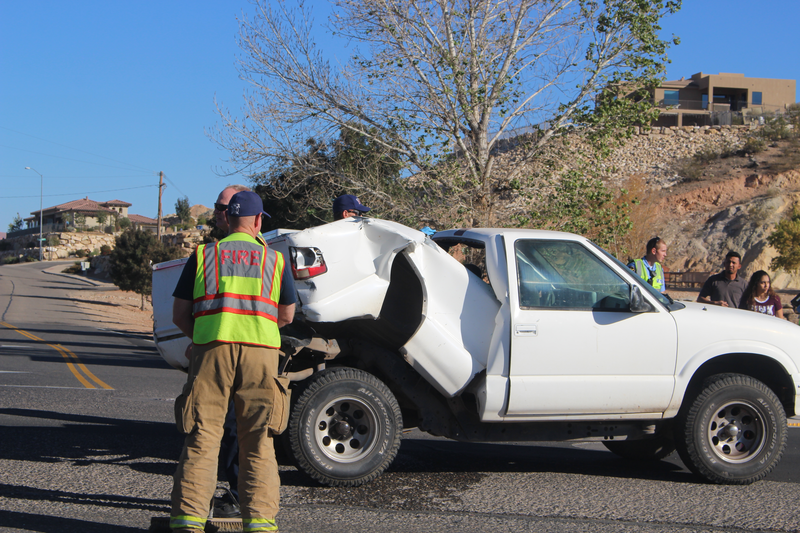 ST. GEORGE — A compact truck trying to turn left from River Road in a construction zone was struck in the rear by a full-size pickup Monday. St. George Police Officer Andy Mickelson said the compact Chevy pickup had stopped on River Road, waiting to make a left turn onto 2800 South. The intersection is right in the middle of a construction zone, lanes are limited, and there was no left turn lane available to the driver. A full-size Dodge Ram pickup came around the bend in the road, Mickelson said, and the driver of the Dodge was distracted by his daughter in the truck. The driver looked down to talk to her, and when he looked back up it was too late. The Dodge slammed into the back of the Chevy truck at approximately 30 mph. Minor injuries were reported, Mickelson said, but no one was transported to the hospital. “Probably just aches and pains from getting hit at 30 mph,” Mickelson said. Mickelson said the driver of the Dodge was issued a citation for careless driving. “There are too many distractions in our vehicles nowadays,” Mickelson said. Units from the St. George Police and Fire departments, and Gold Cross Ambulance responded to the scene.